HAWAII CANA - Direct from Hawaii. Contact us for your shipping cost. 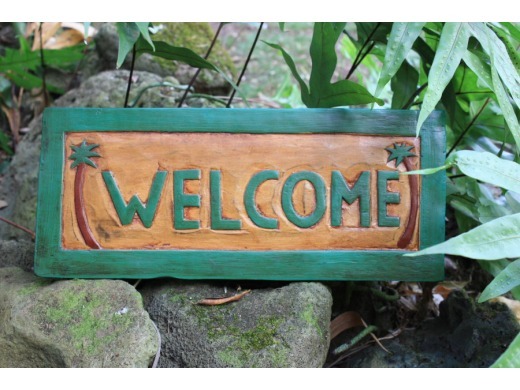 Here is a hand made wooden WELCOME sign featuring a palm tree on each side. The letters and palm trees are raised (hand carved and hand painted). This great piece of handicraft measures 16 inches long by 7 inches tall (41 cm x 18 cm). Great gift idea. Perfect for your home decor or your outdoor living area!